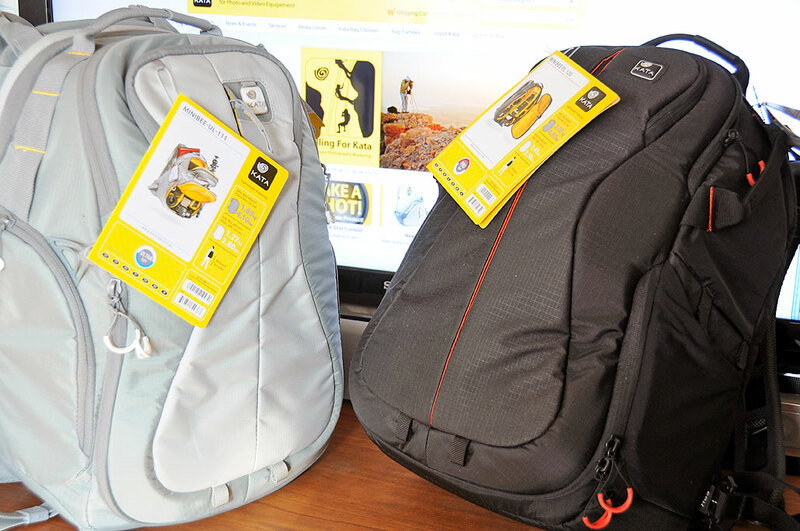 Kata introduced the Bumblebee Ultra-Light backpack in April, 2010. The pack was an instant hit and won the prestigious 2010 reddot Design Award. Inspired by the success, Kata resized the bag for those who wanted the features of the Bumblebee, but in a more nimble package. The results are the Minibee UL-111 and Minibee PL-120. Like the Bumblebee, these new backpacks leverage Kata’s innovative use of technology, materials, and design to give lightweight protection without sacrificing comfort (padded straps, air space between the body and pack) or durability (rigid metal frame). 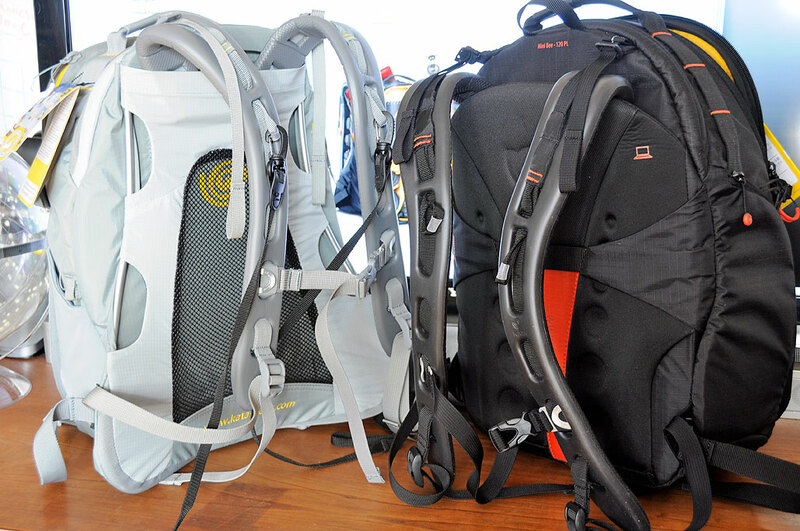 Both bags come with tripod holder, rain cover, camera straps, and the Gecko Harness system. Both bags have a padded zippered compartment which will accommodate most 13” laptops, an iPad or netbook. These bags were also designed to comply with all current airline on-board luggage regulations. The differences between the UL-111 and the PL-120 are not many, but are worth noting. We’ll detail them as appropriate. The MiniBee UL-111 backpack will fit a DSLR with up to a 70-200 f2.8 lens attached. The internal compartment can be configured to house three to five lenses, a flash, and the typical accessories (cables, charger, etc…). The bag is designed with a double compartment concept: In the lower compartment there is a special padded camera insert, and Cocoon Pouches and Aeriform Dividers to fit the camera/camcorder with accessories, while in the upper compartment there is plenty of space for personal effects. When needed, the lower compartment can be emptied of the padded dividers and pouches, and the zippered partition between the two compartments can be opened to create one large storage space. The Minibee PL-120 PL is a backpack designed for the professional on the move. It provides both the carrying and storage capacity (body with 70-200 f2.8 lens attached, room for up to eight lenses and accessories) for the equipment needed for a day’s shoot. The design of the bag is such that it is easy to grab, comfortable to use, and offers quick access to the DSLR. With the PL-120, Kata moved the aluminum frame inside the pack, enabling a trolley strap to be added to the back. Anyone who ever had to race from one airport terminal to another with a few bags will immediately appreciate the significance of this additional touch. Like the UL-111, the PL-120 has a variety of external pockets to stash items (wallet, phone, water bottle etc…) for easy access. And as with all Kata bags, the internal Aeriform Dividers and Cocoon Pouches may be moved to create a custom fit for the gear. Unlike the UL-111, this bag may be opened fully or sectioned into top and bottom access. This is an ingenious feature as it combines the accessibility of a suitcase with the working convenience of a backpack. For those looking for an ultra-light camera backpack, both the Minibee UL-111 and the PL-120 should be on their short list of candidates. We have had extensive experience with Kata’s Gecko Harness System on other packs. We found them to be extremely ergonomic and a very comfortable fit. The pack stays securely harnessed on the back even over rough terrain. Both of these new packs have interesting features. We really like the multiple access options of the PL-120, especially the ability to fully open the pack. It is a huge convenience not available in any other backpack. We think it is genius!